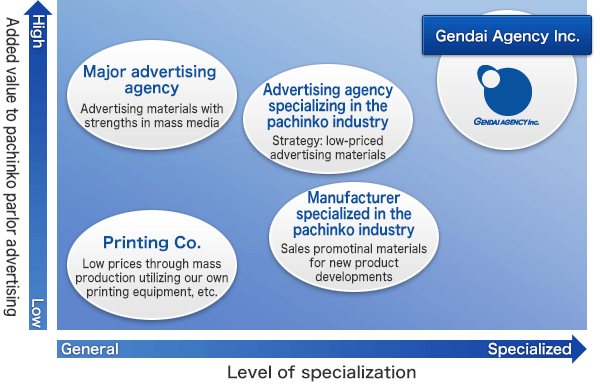 Our Position and Strengths | GENDAI AGENCY Inc. Specialization in the pachinko industry has made it possible to provide the high value-added services required by pachinko parlors. We specialize in the pachinko industry and are the only agency with a nationwide network. This enables us to propose high-value-added advertising plans based on an exceedingly wide range of information. We comprehensively produce complete advertising packages that are ideal for attracting customers to pachinko parlors. We provide original advertising plans and designs based on promotional strategies uniquely tailored to individual pachinko parlor operators.